Today was another great City of Chicago political day. Chicago Clout was invited to visit the Campaign Headquarters of Paul Vallas. Paul Vallas has been a public servant helping the City of Chicago for many years. During his service, there was no major drama, a real change of pace in Chicago. Today, Paul Vallas was shooting a commercial for his Mayoral campaign. Many candidates would be under extreme pressure, but Paul kept everything under control. Imagine being in a room, with every word and action under scrutiny. Imagine every movement, every word under bright light and video cameras. 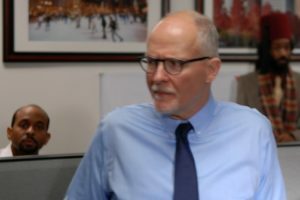 After the video shoot, Paul Vallas made time to introduce himself and explain some of his views on issues facing Chicago. Considering all the things going on, it made me comfortable he could multitask flawlessly. This goes well to his future leadership as Mayor because Chicago will need to oversee many problems. Mr. Vallas committed to reach out to all of Chicago and you can call and schedule a meeting. What a great treat to have Paul Vallas speak to your group. As the campaign continues, I am sure the ability to meet and greet will be tougher. I was also impressed with Chris Kelly, Deputy Campaign Manager, Peter Ortolano, retired City of Chicago Hoisting Engineer. I am most proud Paul Vallas committed to Chicago before the current Mayor announced his departure.